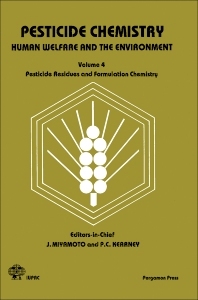 Pesticide Chemistry: Human Welfare and the Environment, Volume 4: Pesticide Residues and Formulation Chemistry covers the proceedings of the Fifth International Congress of Pesticide Chemistry. The book covers research topics that tackle both improved agricultural production and public health concerns. The papers presented in this volume are organized into two parts. The first part tackles pesticide residues and methodology, which includes analysis of xenobiotics in air; pesticides residues in soil and water; and schematic flow diagram for pesticide analysis. The second part covers formulation chemistry, such as formation of drift and basic considerations for its reduction; the effects of adjuvants on biological activity of herbicides; and effect of formulation on vapor transfer. The book will be of great interest to professionals and researchers whose work involves pesticides.